« Fall events in Brooklyn and Seattle! Official Brooklyn Book Festival schedule announced! Today, BBF posted their full schedule for their 2012 Bookend Events (including ours) that lead up to the fest as well as the main event on Sunday, Sept. 23. Thursday, Sept 20 at 7pm during the Bookend schedule, DEBUT LIT will be showcasing some fabulous new writers with our friends from Pacific Standard, a microbrew pub in the festival vicinity, and PitchKnives & Butter Forks bloggers Jason Leahey and Shannon Dunlap. 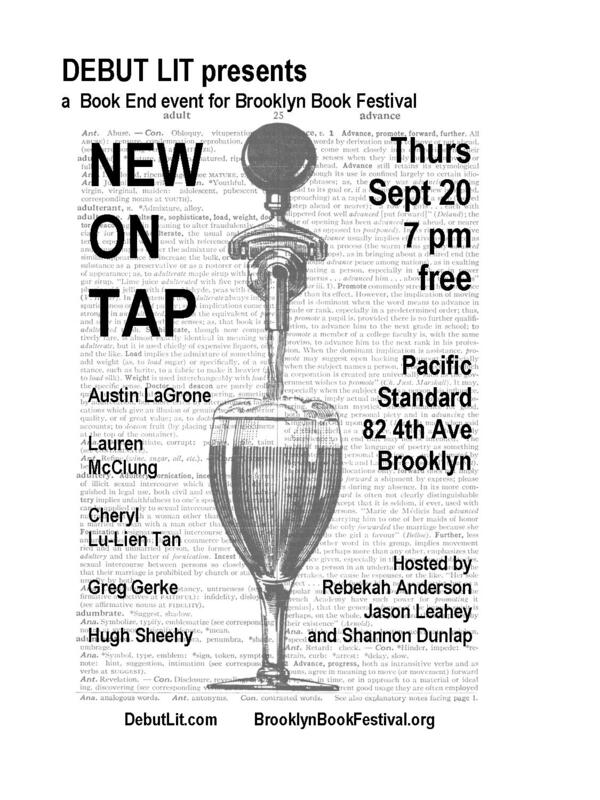 The event will be on the theme “New On Tap,” since, you know, it’s all about new writers and we’re in a brewpub. Get it? New on tap? Ah well, we try. To entertain you, we’ll have a mix of poets, fiction writers and a memoirist who will each read a piece of original work on theme. Plus introductions, remarks and other interesting tidbits from your hosts Rebekah Anderson of DEBUT LIT and the Leahey-Dunlap duo from PK&BF. Come out and join us in celebrating new work! And for Pete’s sake, bring some friends!